^ Jupiter Irregular Satellite Moon Page Saturn Uranus Neptune. ciw.edu. ^ Robert Roy Britt. Hints of Unseen Moons in Saturn's Rings. 2004 [2009-03-15]. ^ David Jewitt. 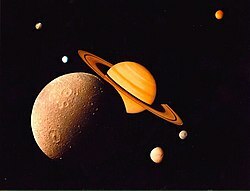 12 New Moons For Saturn. University of Hawaii. May 3, 2005 [2009-03-15]. （原始内容存档于2005年5月11日）. ^ Emily Lakdawalla. Twelve New Moons For Saturn. May 3, 2005 [2009-03-15]. （原始内容存档于2006年8月31日）. ^ MPEC M45: Eight new satellites of Saturn (PDF). IAU Minor Planet Center. 2007 [2009-03-15]. （原始内容 (PDF)存档于2006-09-01）. ^ NASA - Cassini Finds 'Missing Link' Moonlet Evidence in Saturn's Rings. nasa.gov. ^ CASSINI IMAGES RING ARCS AMONG SATURN'S MOONS (Cassini Press Release). ciclops.org. （原始内容存档于2010-01-02）. ^ Natural Satellites Ephemeris Service. IAU: Minor Planet Center. [2008-12-20]. 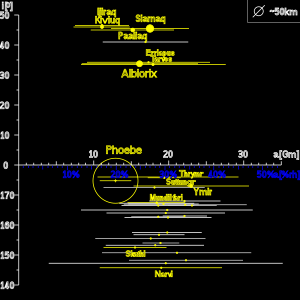 ^ Williams, David R. Saturnian Satellite Fact Sheet. NASA (National Space Science Data Center). 2009-03-08 [2008-12-20]. ^ S/2008 S 1. (NASA Cassini Saturn Mission Images). ciclops.org. ^ Calvin J. Hamilton. Hypothetical Planets. solarviews.com.